When I was far younger, buying cards for holidays such as Mother's Day was a luxury, mainly because I had no money. As I got older, got employed and got some money (even in small amounts) the economic challenge of buying a Mother's Day card was solved, but it left me with an even larger one: What card to buy? It all goes back to my mother. 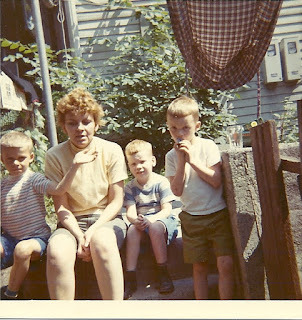 Saying that my mother was a "tough lady" is like saying that there definitely is a chance of a Tuesday next week. In point of fact she was one of the toughest human beings I have ever met. Growing up she really didn't express all that much in the way of emotion, save for a round of "pissed off" when her sons would inevitably miss that large bathroom target known as a toilet bowl. Love? Hugs? Not so much, although I know for a certain fact how much my mother loved all of her children. She just wasn't able actually say it in words. Luckily, at least for me, there were a few scattered times when she showed it, and for that I am grateful. That toughness never left my mother by the way, up until her passing. Speaking of tough, that was my final act as a son, namely to insist that my mother be allowed to pass away with the dignity that she would have demanded. For that moment I was Doris Albert. Prior to her passing, but in later years, my mother did start to have interests in some things. She liked being in the yard and she enjoyed flowers, so on Mother's Day I would usually get her something that could be planted. That was easy. The hard part? Finding a card to go with the plant. My mother simply wasn't that wonderful, loving person, in line with what's expressed in most greeting cards. Oh, and my mother's demeanor wasn't limited to her children; if anything I think she was remarkably consistent in how she approached most thing in life. Now I don't mean any of what I've written be demeaning in any way, shape or form, as my mother was a product of her own upbringing and circumstances. I know, as I've grown older, that she did what she thought to be right, and, by the way, my mother always had strong feelings about what constituted "right". Hindsight is always 20:20, and again as I've grown older I've become even more acutely aware of just how difficult it must have been for her as a single parent. There was no manual and virtually nowhere she would have gone for help. Yet here I am, typing this, so the end product couldn't have been all that bad. I do think of my mother often, and in fact I've written more than a few things about her over the years. Some of it is fairly direct, but maybe that's something I inherited from her. That's another part of her her "living legacy", if you will. So you'll forgive me if I don't write a glowing tribute to how wonderful a person my mother was, and how much I miss her on this day to appreciate mothers far and wide. In fact I don't really "miss" my mother in the same way that other's certainly do, and that's okay. If anything, I'd like to think that, years after her passing, my mother is now in a place where the anger has gone and it's been replaced by something I don't ever really remember her expressing in this life: Namely joy. Another part of my job, also in the "living legacy" department, is to try and live a life filled with more joy than anger, more blue skies than pain*. The irony is that my mother didn't teach me this, but I learned it from her never the less. Some lessons need to be taught by example, even if it's not the example you think. Happy Mother's Day in Heaven Mom.